Reading and share top 14 famous quotes and sayings about Saved By Grace by famous authors and people. Browse top 14 famous quotes and sayings about Saved By Grace by most favorite authors. 1. "Doesn't it honor Him more when His children no longer see themselves only as sinners saved by grace, but now as heirs of God? Isn't it a greater form of humility to believe Him when He says we are precious in His sight when we don't feel very precious?" 2. "Grace is the first and last moving cause of salvation; and faith, essential as it is, is only an important part of the machinery which grace employs. We are saved 'through faith,' but salvation is 'by grace'." 3. "It is a doctrine, as I believe, taught us in Holy Writ, that when a man is saved by divine grace, he is not wholly cleansed from the corruption of his heart. When we believe in Jesus Christ all our sins are pardoned; yet the power of sin, albeit that it is weakened and kept under by the dominion of the new-born nature which God doth infuse into our souls, doth not cease, but still tarrieth in us, and will do so to our dying day. "C.H Spurgeon"
4. "...it is a mistake to reduce every decision about Christian living to a "Heaven-or-Hell issue. "For example, some ask if the Bible specifically says a certain action is a "sin" or will send them to "Hell." If not, they feel free to indulge in that action unreservedly and ignore any scriptural principles involved. But this approach is legalistic, which means living by rules or basing salvation on works. It treats the Bible as a law book, focusing on the letter and looking for loopholes.By contrast, the Bible tells us that we are saved by grace through faith, not by our works (Ephesians 2:8-9). Grace teaches us how to live righteously, and faith leads us into obedience. (See Titus 2:11-12; Romans1:5; Hebrews 11:7-8.)" 5. "Have mercy, O Lord, on my children,In my children,Call to mind your childhood,You who were a child.Let them that are like your childhoodBe saved by your grace." 6. "We can draw no deadlines for God. He hastens or He delays as he sees fit. And his timing is all-loving toward his children. On, that we might learn to be patient in the hour of darkness. I don't mean that we make peace with darkness. We fight for joy. But we fight as those who are saved by grace and held by Christ. We say...that our night will soon- in God's good timing- turn to day." 7. 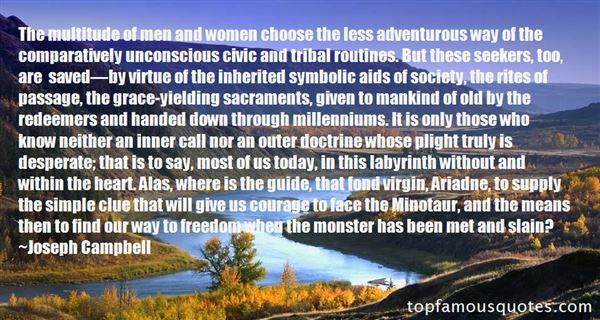 "The multitude of men and women choose the less adventurous way of the comparatively unconscious civic and tribal routines. But these seekers, too, are saved—by virtue of the inherited symbolic aids of society, the rites of passage, the grace-yielding sacraments, given to mankind of old by the redeemers and handed down through millenniums. It is only those who know neither an inner call nor an outer doctrine whose plight truly is desperate; that is to say, most of us today, in this labyrinth without and within the heart. Alas, where is the guide, that fond virgin, Ariadne, to supply the simple clue that will give us courage to face the Minotaur, and the means then to find our way to freedom when the monster has been met and slain?" 8. 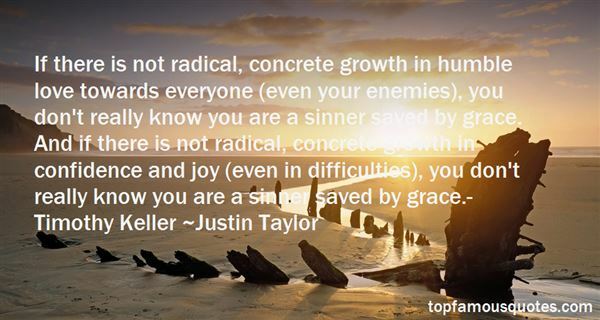 "If there is not radical, concrete growth in humble love towards everyone (even your enemies), you don't really know you are a sinner saved by grace. And if there is not radical, concrete growth in confidence and joy (even in difficulties), you don't really know you are a sinner saved by grace.- Timothy Keller"
9. 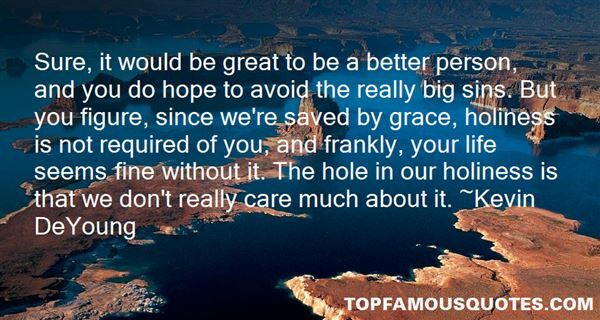 "Sure, it would be great to be a better person, and you do hope to avoid the really big sins. But you figure, since we're saved by grace, holiness is not required of you, and frankly, your life seems fine without it. The hole in our holiness is that we don't really care much about it." 10. "Evangelicals believe they are saved by grace through faith but then add a man-made waiver that you have to work as hard as you can can meet middle-class behavioral patterns to hang onto it." 11. "If we are saved by grace alone, this salvation is a constant source of amazed delight. Nothing is mundane or matter-of-fact about our lives. It is a miracle we are Christians, and the gospel, which creates bold humility, should give us a far deeper sense of humour and joy. We don't take ourselves seriously, and we are full of hope for the world." 12. "I asked her what was so scary about unmerited free grace? She replied something like this: "If I was saved by my good works -- then there would be a limit to what God could ask of me or put me through. I would be like a taxpayer with rights. I would have done my duty and now I would deserve a certain quality of life. But if it is really true that I am a sinner saved by sheer grace -- at God's infinite cost -- then there's nothing he cannot ask of me." 13. "The gospel is neither religion nor irreligion - it is something else altogether. Religion makes law and moral obedience a means of salvation, while irreligion makes the individual a law to him - or herself. The gospel, however, is that Jesus takes the law of God so seriously that He paid the penalty of disobedience, so we can be saved by sheer grace." 14. "Because I am not yet living up to what Jesus expects me to be in those red letters in the Bible, I always define myself as somebody who is saved by God's grace and is on his way to becoming a Christian. (...) Being saved is trusting in what Christ did for us, but being Christian is dependent on the way we respond to what he did for us." In '82 Brazil showed that you can't win the World Cup without a solid defense."